A revolutionary design makes the Boiance Face Rest Crescent one of the most comfortable massage table accessories on the market today. The Boiance Face Rest Crescent difference is found in water spheres embedded in multi-layer foam cushioning supporting the face and weight of the head. The ultra-comfortable padding and water spheres combine to deliver an exceptional feeling of comfort and relaxation. The water spheres allow the face rest to conform to the face creating a sense of buoyancy. 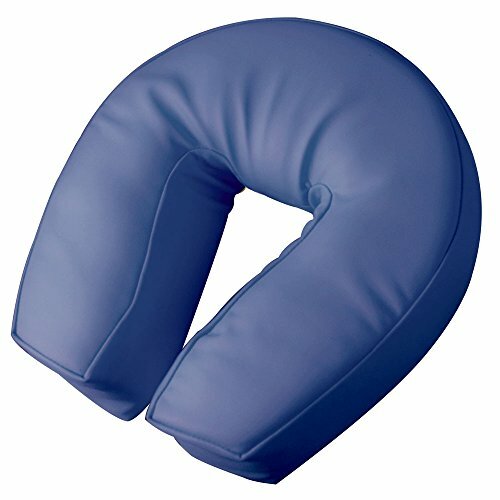 The Boiance Face Rest Crescent also features a unique, very open space to avoid all pressure on the eyes and sinus cavities. This unique design creates incredibly comfortable support your clients will love! With her experience and expertise in the field of massage therapy, LMT Patricia Binder has designed and engineered the face rest crescent that your clients will love. TerraTouch Oakworks’ PVC- free premium polyurethane fabric has excellent resistance to oil, abrasion, and tears. TerraTouch passes testing for Cytotoxicity, Skin Irritation and Sensitization as well as CA TB117 Fire Retardance testing. Clean your uphol­stered items when needed using a mild solution of 4:1 diluted non-alcohol cleaner such as Formula 409, Fantastic, Green Windex or some other non-abrasive cleaner. If you have any questions about this product by Oakworks, contact us by completing and submitting the form below. If you are looking for a specif part number, please include it with your message.